First there are a few main points that need to be addressed to help you understand where some of these ideas and changes are coming from. Earlier this year Apple started seeding beta versions of its upcoming redesigned Music application. That app introduced several new UI concepts that had previously not been seen in any of Apple’s software. A second factor that helped influence these design changes (to a lesser degree) is the rumor that iOS 9 will change the system font to San Francisco, the typeface created for the Apple Watch. All of these mockups use that font. Click any of the mockups below to enlarge. Let’s start with the Featured and Explore pages. These are two of the first things most people see when they open the App Store. There aren’t a whole lot of changes that I’d recommend here, but there is one notable difference. As you can see in the images, the Search tab bar button has disappeared, and there is now a search button on the top navigation bar next to the Wish List button. 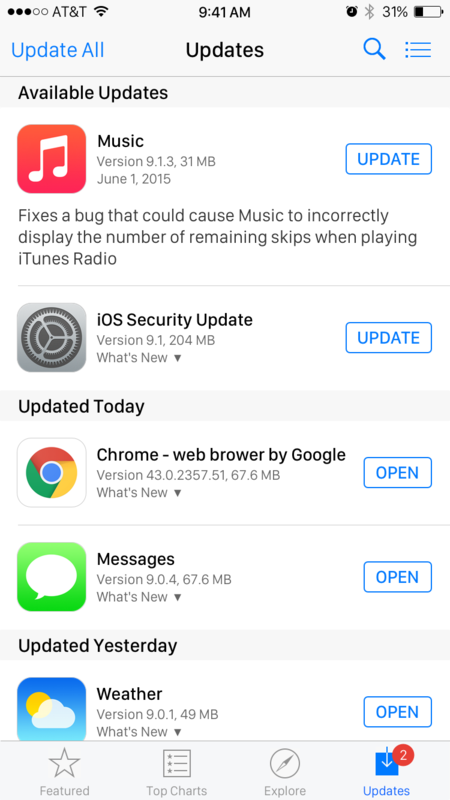 This change was inspired by the iOS 8.4 Music app. There’s no real need for a entire tab bar button for this feature. Everything that’s currently on the Search tab can be moved into a new view that shows up when you tap that button. By putting the search button in the app’s navigation bar, it’s just as accessible as it is in the tab bar, but it’s more in line with the Apple’s other software. There’s even precedent for putting the search button next to another one in the navigation bar—just look at the Calendar app. Tapping the search button brings up the same Trending Searches list along with the keyboard and search bar. Again, this is a design that’s taken directly from the Music app beta, which handled trending iTunes Radio searches the same way in one build. That app only listed five top searches, while this mockup lists ten to maintain the same number as the current App Store design. The Purchased list is currently accessible through the Updates tab. It has been since it was first introduced several years ago. Unfortunately, Apple has been pretty inconsistent in how it handles the location of this list across its stores. In the App Store it may be in the Updates tab, but the iTunes and iBooks Stores give it a whole separate tab. I’m not convinced that this feature really deserves its own tab, though. Originally I had considered moving the Purchased list (and the Wish List) onto the Explore page, but eventually, through a little brainstorming with 9to5’s Michael Steeber, I settled on something better that makes both of those screens more readily available. In the new Music application, the iTunes Radio history screen is divided into two sections: “Played” and “Wish List.” Following that lead, I’ve added a division between two similar types of lists in the App Store: the Purchased list and Wish List. Now when you tap what is currently the Wish List button (again, accessible from any screen just like the search function), you’ll be able to pull up your purchase history as well. Not much about the purchase list itself would change, making it just as quick and easy to access as the Search screen (the buttons are right next to each other), but quicker to actually pull up your content (because, unlike other views, the purchase history list is actually cached and loads instantly with little need for network activity of any kind). There’s just one small issue with this layout, though it’s easy to address. Currently the purchase list includes a search bar for quickly finding what you’re looking for and a segmented control that lets you switch between your entire purchase history and only the apps that aren’t currently installed on your phone. Carrying that over to the new design wouldn’t work because there’s already a different segmented control for switching between the Purchased and Wish List views. Instead, I borrowed yet another UI element from the new Music app. Instead, tapping the ••• button in the upper left corner of the Purchased screen now pulls up an action sheet containing a switch to show or hide currently installed apps. This is similar both in design and language to the “Show Music Available Offline” option in the iOS 8.4 Music app (though the phrasing on mine may be a little more clear). This brings us to our final tab: Updates. (I didn’t mock up Top Charts because there are far too many UI elements to recreate on that page—especially text—just to show off the new font, search button, and four-icon tab bar you can see in all the other images). On this screen I had to make one concession regarding the placement of the Update All button. Since the dawn of time (or at least, the initial inclusion of that button), it has always been located in the upper-right corner of the screen. In order to accommodate the new ever-present search and list buttons, however, I had to move it to the opposite side of the screen. It’s not a big change, but if it were to happen it were certainly frustrate some users (myself included) who repeatedly hit the wrong button out of reflex. However, that one relocated button is the smallest change I’ve added here. The Updates tab is the one that needs the most functional revision. Currently it only serves to show available updates to third-party apps you’ve installed (and to lead to the Purchased page, but that’s now moot). It’s time to give this screen a big capability boost. This change was inspired by two very different sources: OS X and Android. Like its mobile counterpart, the Mac App Store contains five tabs, three of which are the same across platforms: Featured, Top Charts, and Updates. The Mac’s Categories tab lines up roughly with the iOS Explore tab (I even considered renaming the Explore tab to Categories in my mockup, but decided against it since the Featured and Top Charts tabs already have buttons with that name). The Mac also has a Purchases tab, which functions like the list I moved around on iOS earlier. An ever-present search bar on the Mac App Store gives users access to that function at any time, just like my redesigned iOS App Store. It’s easy to see how the design of these two App Stores have influenced each other, so let’s take it a step further. Depending on how long you’ve been a Mac user, you may recall that an app called Software Update previously handled system updates. These days that app is gone (unless you use Apple software on Windows! ), and the Updates tab on OS X provides updates not only installed third-party apps, but for the entire Mac operating system. Security patches, OS X updates, new versions of Safari and iTunes, and much more are distributed through this tab. On iOS, “Software Update” is still tucked away in the Settings app where most people never go. For the sake of consistency and ease of use, it would make a lot of sense for Apple to move iOS system updates and security patches into the App Store. Let’s go beyond that, though. As I mentioned earlier, Android was also an inspiration behind this change, and this is where that comes into play. On Android, built-in applications like the messaging app, browser, phone dialer, and even the home screen (or Launcher, as it’s called over there) can all be updated independently of the operating system through the Google Play Store. This allows the company to rapidly iterate on its software and add new features and fixes. In fact, Android users should be familiar with the term “Update Wednesday,” or the day Google releases most of its new mobile updates each week. Apple needs to bring a similar update mechanism to iOS. In my mockup, you may notice that several built-in apps are included among the updates: Messages, Weather, and Music. A third-party app (Chrome) and an iOS security update are listed as well. I’m not arguing that users should be able to delete the built-in apps and re-download them on the App Store. Just that the interface for updating them should be combined with App Store updates. Considering Apple’s recently gained reputation for subpar software releases (see iOS 8.0 and 8.0.1 for just a few examples), it wouldn’t be such a bad idea for the company to include the ability to quickly respond to bugs with fast, individual releases that don’t have to wait until a whole iOS update can be pushed out. A Messages update could introduce a change to allow voice clips to be sent along with photos. A Music patch could, as seen in the mockup, fix a small issue with iTunes Radio or some other component. Some updates could also bring along updated system frameworks and libraries. Imagine if Apple could improve performance in the webviews in every app just by pushing out a new version of Safari with a WebKit update through the App Store. Rebooting your phone and doing a lengthy iOS update just to fix a Music glitch would be a thing of the past (although some updates, like security fixes would still require a reboot). In theory, even SpringBoard (the app that powers the home and lock screens, among other key system features) could be updated and restarted much faster than the time required for a full reboot. Of course, if this were to happen, some users might question if big iOS updates were even necessary anymore. The answer is a resounding “yes.” As with Android, new iOS APIs for developers would still need to be released, and major iOS updates are just the way to do that. Each major release could ship with updated built-in apps to take advantage of new system-wide features, then subsequent bug-fix or new-feature updates to those apps could be released one at at time as needed. There’s one final, very minor change that I’d make to individual app listings. When you open an app’s page on the store now, you’ll see screenshots of the iPhone version as well as the Apple Watch version, if the app has one. I’d set the Apple Watch section to be hidden unless a watch was actually paired with the phone to help keep the pages clutter free. So there you have it: a handful App Store changes that, in my opinion, would help make the app a bit easier and faster to use while providing a big boost in the importance of the Updates tab and finally giving Apple a way to remove the obscure Software Update panel in the Settings app. How many of these changes do I expect to see Apple make in iOS 9? Unfortunately, none. Perhaps the company will eventually see the merit in rearranging certain UI elements to make them more accessible or consistent with apps like Music and Calendar, and maybe one day someone will finally insist that they combine the various software update screens into one interface like on the Mac, but I’m not holding my breath for any of these changes to show up on Monday.